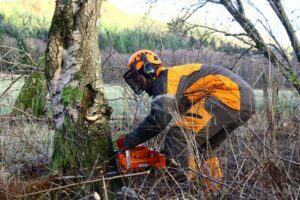 Arborist Direct Edinburgh tree stump removal services: Sometimes, even after a tree has been cut, the stump can still remain in place for a long time. You need to decide if you want the tree to grow again or remove the stump altogether to make space for a brand new tree or possibly turf over it for lawn. Our job is to provide you with multiple tree stump removal options so you can make an informed choice based on your personal preferences. We will explain to you what each solution entails. Removing the stump can be done in a couple different ways: either tree stump grinding or tree stump removal. Decaying stumps can be the favorite refuge of various pests which can cause potential damage to your property especially since stumps and roots continue to grow long after the tree has been cut or has fallen. Removing a tree stump implies to remove the roots of the tree and these roots can run deep into the ground, so it might require some considerable time and effort. We take care of everything from cleanup to hauling. Wood and brush will be removed from the site and disposed of properly. Let us restore your property to its former glory and get rid of that ugly stump that is an unsightly blemish on your landscape. 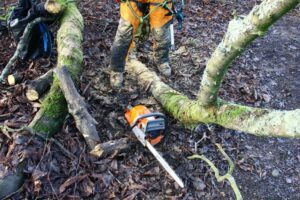 Our team of experienced arborists is skilled at removing stumps of all kinds in record time without damaging your garden or any other part of your property. They have worked for decades in the tree care industry and know what it takes to remove a stump successfully. Your satisfaction is guaranteed and we will never let you down. We know what an eyesore a stump can become and we will hurry to deliver the service required as fast as possible from the very moment you contact us. Coming to your property to take a first look and make a preliminary assessment is the next step and from then on we will able to give you a more accurate quote and break down the price offered in order for you to understand our pricing. The estimate usually includes hauling away the stump pieces but if you want to save money, you can still do the clean-up yourself. If we are in the presence of a small stump, we can directly come to your house and proceed to remove the stump right away. In any case, keep in mind that no job is too big or too small for us. Everything you need is here.. So don’t wait..
Our stump removal experts possess state-of-the-art stump removal equipment and the latest tools to perform their tasks in the most efficient way possible. They never leave any mess behind them and take care of your property like if it was their own. We offer both commercial and residential stump grinding and removal services and we have worked with both local companies of all sizes and homeowners in the region for years now. Whether you need only one stump removed or several, we can always assist you and will provide you with the same quality of service regardless. All our clients are VIP and received excellent value every time they spend their hard-earned money with us. We use a high-speed disk and teeth to grind the stump and the roots to pieces. Once it is done, removal is rather easy and you will soon be able to plant a new tree, grow grass or even to put in a garden bed if you like flowers. When performing any of our tree care services, we favour environmentally-friendly practices in order to limit the impact on the local ecosystem and also because it is part of our core values and principles. Stump removal is different from stump grinding in the sense that we totally remove the stump and also the underlying roots while stump grinding simply consists in getting rid of the stump on the surface without attacking the roots. Instead of cutting the stump to ground level, we can dig deeper and remove the root ball that is often several times larger than the tree itself. This process is time-consuming and requires a lot more effort than stump grinding. It costs more money too. After the stump removal process is over, there will generally be a huge hole in the ground as opposed to a small hole covered by mulch, dirt, and dust if you choose classic stump grinding techniques. In both cases, you will need the assistance of stump removal professionals. Let us clear the undesirable stumps from your property. It’s time to reclaim your land and make way for new construction! An added benefit of this will be increased real estate value since stump removal is here to beautify your landscape with absolutely no downsides. Your underground power lines are safe and we will extreme attention not to damage them during the stump removal and grinding process. Our stump removal service leaves absolutely no footprint and nobody will be able to determine that a tree or stump once stood there. The prices for tree stump removal we offer are extremely competitive and you will get excellent value for your money. Of course, you can find someone cheaper if you don’t mind getting some sub-par work done, but it is always better to spend a little more and getting better quality. Call us now at 0131 510 5464 if you need tree stump removal services near you. Our tree care specialists are always available to answer your questions and give you as much help as they can. Book an appointment today by giving us a call or filling out the inquiry form on our website. Get a free, no obligation, estimate simply by calling us today and enjoy prompt and reliable stump removal services in your area. Our friendly staff and decently priced services are here to make your experience a unique one.